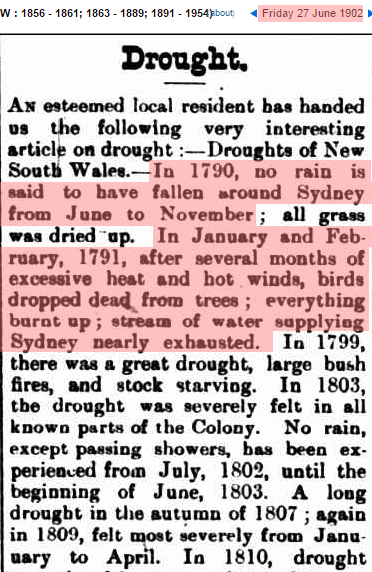 27 Jun 1902 – Drought. Too many people cooking with wood burning stoves I presume. Obviously a TOBS issue, if nobody had been observing precipitation values in 1790, this would not have been reported. Besides, people back then were stupid and did not know the difference between rain and sunshine. We just need a single tree in Siberia to really know what happened in Sydney 225 years ago. I blame your 1790 Holden Commodore station wagon.